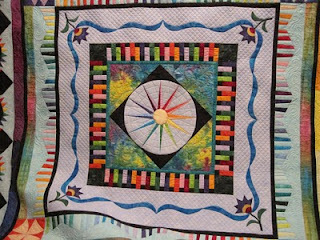 This beautiful Round Robin Quilt belongs to Janice Pope. A lot of hard work and love went into making this quilt top. Janice is a member of the BFF quilt bee. If you happened to be at the December 2009 Capital Quilt Guild meeting, the BFF bee showed all of their tops that they had recently gotten back. It was amazing to see how different and beautiful they all are. I got to spend a lot of time with this quilt while I was quilting it for Janice. The batik fabrics really sparkle in this quilt. 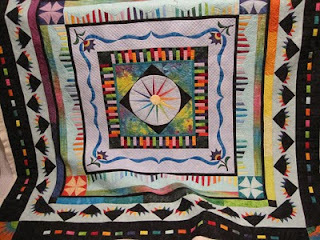 Janice wanted different designs quilted in each border. I had a lot of fun picking out designs and working on the quilt. To give you perspective the crosshatching in the appliqued ribbon boarder is 1/2 inch squares. 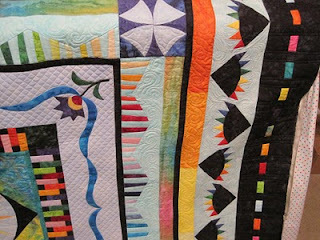 I love the texture it give the quilt. I stitched in the ditch around everything. It was extremely time consuming, but was really worth the time. I did soft swirly files in some areas to counter the straight lines in the piecing and the crosshatching. I wanted to keep the graphic quality of the solid black so I changed to black thread and did quilting that would hide a little more and let the fabric sing. Olympic Challenge Quilt - Better late than never!